A. How do you engage the group? The Focused Conversation method is a structured process that helps a group journey through a conversation together. it intentionally moves through a topic beginning with things that can be observed (facts/data) and gets all voices in the room to share simple observations. It calls forth information tied to individual experiences to enrich the data to be considered. The group is then asked to contemplate this rich data, to draw forth meaning, consider options, possibilities and questions. A last stage is to decide what action / conclusion to make - whether as individuals or as a group. The process is intentional in seeking full participation from everyone and making space for the variations in human experience to be included for consideration. 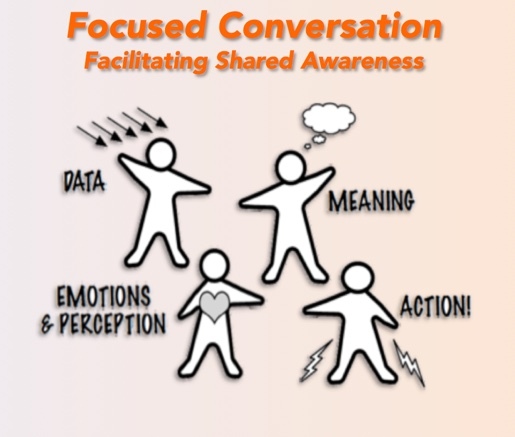 Focused Conversation - Facilitating Shared Awareness provides an overview of the process. B. How else can you use the Focused Conversation? The Focused Conversation provides a strong framework on which many things can be built. In addition to engaging a group in conversation on a topic of interest, it offers a structure for many other things. The Focused Conversation can be the basis for an entire conference. The last slide in Focused Conversation - Facilitating Shared Awareness shows the structure of a one-day event supported by the ORID framework of the Focused Conversation. C. How do you design a Focused Conversation? The ToP Facilitation Methods course and its participant manual focus on building this skill. A great additional resource is an article by Brian Stanfield entitled "The Art of Focused Conversation". Another great resource is the book The Art of Focused Conversation: 100 Ways to Access Group Wisdom in the Workplace. A useful Focused Conversation Template designed to help structure the conversation is provided in the ToP Facilitation Methods course. 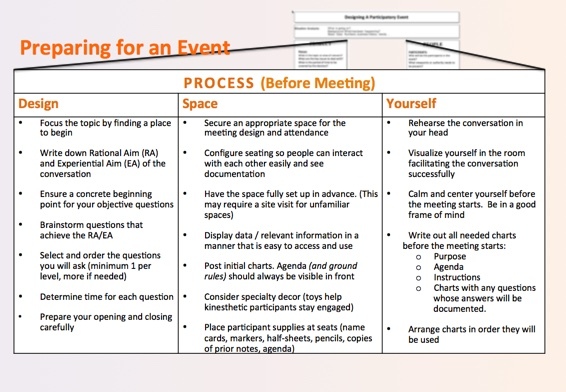 D. What should you do to prepare for a facilitated meeting/event? Session 1 focused on identifying the participants and rational and experiential aims of a meeting - the people and product. With those elements known, the focus shifts to process. Session 2 highlighted the next step in process - matching methods to needs. These are foundational steps in design, but design goes much deeper. Design includes developing the questions to be used, the sequence they will be asked, timing considerations, determining participant engagement strategies, etc.. Tips in Preparing for an Event list considerations for preparing the design, preparing the space and preparing yourself. Tips also address things to do during the event and in follow up after the event. 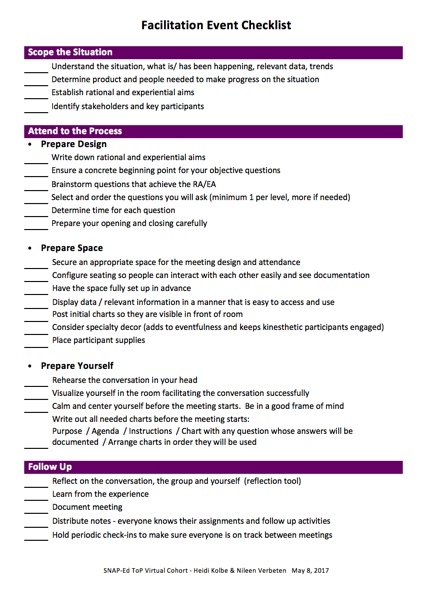 With so many things to consider, a Facilitation Event Checklist also seemed like a great thing to have. E. What are keys to documenting a facilitated event? Getting documentation in participants' hands while the event energy is high is important. The facilitator should have documentation distributed within 5 working days of the event - within one day is even better. 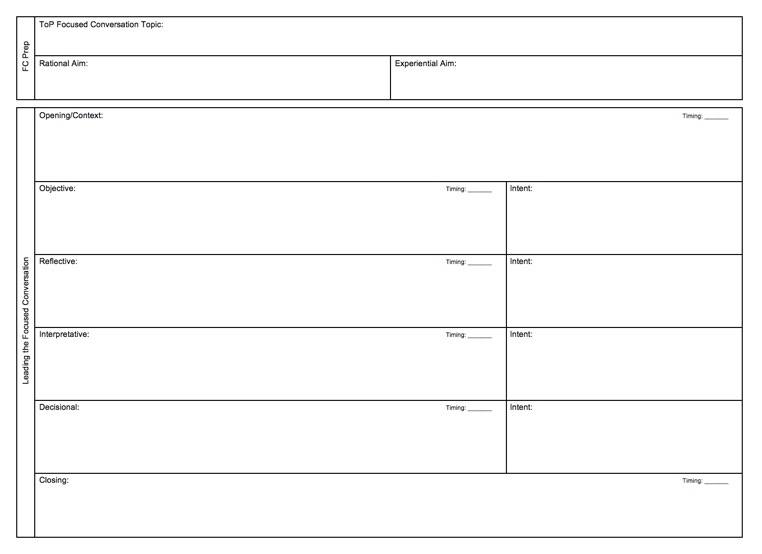 For most situations, documentation should be the participants' input with minimal facilitator narrative. For meetings that include assignments and next steps, those details should be prominently displayed. Simple and clear is best. 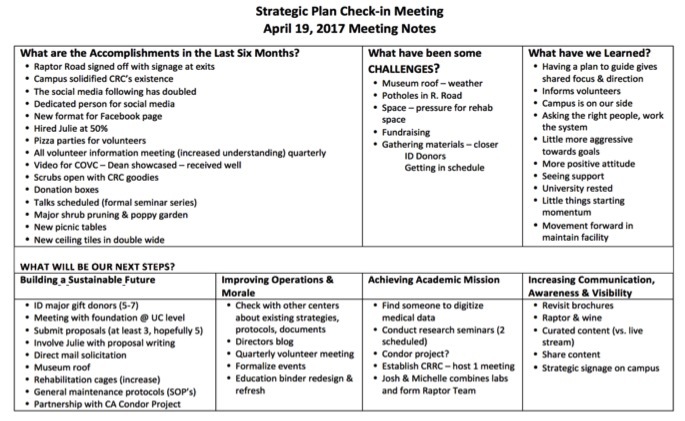 Below is sample documentation of an actual check-in session to evaluate plan implementation. Accomplishments, Challenges and Lessons Learned are displayed at top. Next steps in plan implementation for the four next steps follow. Documentation is a single page. Documentation of an action plan calendar wall appears below. One single page (using a table) details launch, timeline, resources needed and success indicators (Victory) across the top and responsible teams and their accomplishments in rows beneath. Simple, easy to see, easy to track, easy to use as a reminder of commitments made.